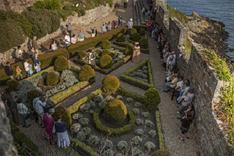 Discover the historic gardens held within the walls of Castle Cornet. There are four historic gardens within the castle walls following the layout of the Plan of Castle Cornet by Bastide that dates to 1734 and which you can see in the Maritime Museum. Governors Garden - planted in formal18th century style, it is designed to resemble a tapestry from above with plants chosen specifically for their ability to be clipped into shape. The Sutler's Garden - The Sutler was responsible for provisions for the soldiers billeted in the castle and was considered an important man being given a piece of land to cultivate as he pleased. The garden is planted in two parts. A 16th century herb and vegetable garden with an adjacent pleasure garden, or 'plaisance'. Lambert's Garden - General Sir John Lambert was held prisoner in Castle Cornet for ten years following the fall of Oliver Cromwell and the return of the monarchy after the English Civil War. He was a noted gardener and is known to have kept one during his time as a prisoner, cultivating medicinal and cooking herbs. The Master Gunner's Garden - laid out in a 19th century domestic pattern, it is a very small area used for growing some vegetables, fruit or herbs and possibly holding a small caged area for keeping small livestock like rabbits and chickens. The garden in situated along the west wall and frequently blasted by the salty drying winds coming straight off the Channel. It would have been a challenge to grow much successfully in this particular garden. The gardens require a lot of upkeep and are tended all year round by our castle keepers, much of it being completely re-seeded during each Winter closure. Besides the formal gardens, there are many other areas planted up around the castle from flowerbeds and traditional pots to climbing roses, fruit tress and a large Mediterranean bed planted up with palms. The wind and seasalt make it a challenging area in which to grow and there is some trial and error but it is a beautiful place to see a wide variety of plantings.